First comes love, then comes... veneers? Why brides are more obsessed with their teeth than ever. But, it turned out, those perfect teeth wouldn’t be as simple as getting a set of veneers. Her dentist recommended work that was considerably more extensive, including braces to straighten her teeth, implants to help with the fact that she was actually missing her lateral incisors due to a genetic condition, a temporary bridge, and whitening. It was a treatment plan that simply could not be completed in a year. So she postponed the wedding. This past October, two and a half years after her engagement, and nearly $25,000 worth of dental work later, Stephanie finally said her vows with the teeth she had always imagined. “I was willing to wait for the smile of my dreams,” she says. And she’s not alone. For many brides-to-be, improving their smile has become yet another must on the pre-wedding checklist, like getting highlights or choosing a florist. The reasons are myriad, and include something old, something new. The desire for great wedding photos — and the permanence of that wedding album — has been around forever, of course. But the added, outside pressure from social media has not. Stephanie Phillips before her treatment. Phillips on her wedding day last month. I was willing to wait for the smile of my dreams. While there is no such thing as a "perfect" smile, and plenty of women are embracing what makes their teeth uniquely theirs — gaps, stains, and all — there's nothing wrong with pursuing a cosmetic procedure to make a change, either. And for many engaged women, that includes three main treatments: whitening, porcelain veneers, and braces. Learn more about each one, including how much time you should set aside for them before the big day, ahead. “Color is always the number one driver, because brides want to have white teeth; they make people look better, younger, and healthier,” says Marashi. It’s particularly popular with brides who already have straight teeth, and just want a little boost for the big day. “Both of my sons got married in the past year, and I treated both of their now-wives, bleaching their smiles in advance of their weddings. They both had beautiful smiles that didn’t require additional work,” says cosmetic dentist Gregg Lituchy, MD, of Lowenberg, Lituchy, and Kantor in New York City. There are three main choices: in-office whitening, dentist-provided trays, and at-home solutions, such as strips. “They all use peroxide to lift stains and brighten the color — the difference is the strength; the stronger it is, the better and faster the result you’re going to get,” says Dr. Marashi. In-office whitening treatments can take as little as a single one-hour session; trays from the dentist require seven to 10 days. 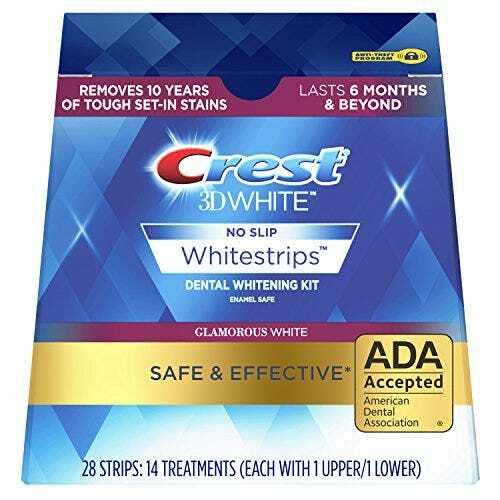 An at-home product like Crest Whitestrips can absolutely do the job, but could require multiple treatments over several weeks. “Many busy brides prefer to have their whitening treatment done in the office because they know they won’t do the home regimen,” says cosmetic dentist Elisa Mello, MD, of NYC Smile Design. If you're splurging on an in-office procedure, schedule it at least two to four weeks before the wedding. “We don’t know what the final color of the teeth is going to be until ten days after they’re whitened,” says Dr. Marashi, who explains that this is due to the teeth initially dehydrating from the procedure, and then later rehydrating, which “settles” the color slightly. “I have had people come in two or three times prior to the wedding to get themselves to the level of brightness they would like to have,” he says. The process typically takes two three-hour visits — and dentists suggest scheduling this at least two to three months prior to the wedding. At the first appointment, they’ll take impressions, prep the teeth by slightly roughening and drilling the enamel, and attach temporary veneers; at the second, the temporaries are removed and the permanent veneers are attached. Though it can be a dramatic procedure, the entire process typically takes only two weeks — though that can be sped up if necessary. “We had a bride come in from the Middle East to fix a broken front tooth, [but] we determined together that she needed more than just a simple bonding,” says cosmetic dentist Zachary Linhart, MD, of Linhart Dentistry in New York City. “We decided to do 10 upper and 10 lower porcelain veneers, but of course, this was Thursday, she was leaving on Sunday, and her wedding was the following weekend in her home country!" So, Dr. Linhart completed the entire procedure in three short days. Ask any metal-mouthed middle-schooler if they’d voluntarily go through braces as an adult, and we’d bet you wouldn’t get a lot of takers. But brides are lining up for straightening treatments these days. Invisalign, for instance, is now the number one pre-wedding beauty treatment, according to RealSelf.com. I decided to take the plunge after I saw my engagement photos. Instead of enjoying them, I found myself zooming in on my teeth. Luckily for today’s time-pressed brides, the process no longer has to involve years of orthodontic appointments. The average straightening time for adults is one year, says Boston-area dentist Emily Joseph, MD, and can often be much shorter than that. “Depending on the severity of the crowding or whatever the orthodontic issue, there are ways to move the teeth in three to six months now as opposed to what used to be two years,” says Dr. Marashi.